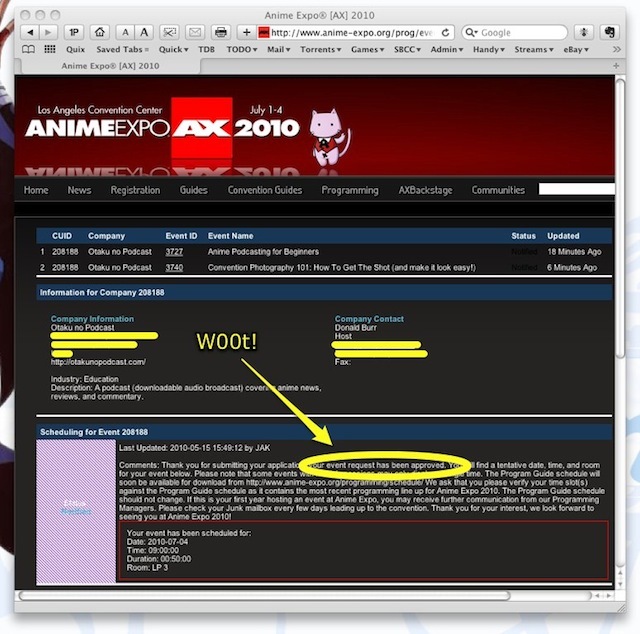 Anime Expo is, I would wager, one of the US’s largest anime conventions (44,000 attended in 2009), and is held every July 4 weekend in Southern California. This year’s event will be held Thursday-Sunday, July 1-4, at the Los Angeles Convention Center. Unlike most fan-run anime conventions, AX (as the cool kids call it) is much more of an industry affair. Don’t get me wrong; you’ll still find plenty of traditional fan favorite events at AX (AMVs, masquerade, various fan-run panels and workshops, console and tabletop gaming, artist alley, etc. ), not to mention a dealer’s room of epic proportions; however there is a decidedly industry-heavy focus to the live programming lineup. This is where you’ll see the industry heavyweights — Bandai, FUNimation, Tokyopop, et al — trotting out their latest offerings, and giving glimpses into their plans for the future. (There are also, I’m sure, quite a few “behind closed doors” industry meetings as well.) Keeping up with the news around AX time is difficult, what with all the announcements and press releases flying about. Many a hot property has had its world premiere in an AX film or video room — for example, at last year’s AX, FUNimation premiered the US release of Evangelion: 1.0 – You are (not) alone, the Eva reboot. Unfortunately, this year’s AX is marred by controversy between the new management at AX’s parent organization and much of the convention staff, who resigned in protest, citing a long chain of grievances including excessive travel expenses (and other financial shenanigans), restructuring of the chain of command, inexperience with the anime industry and how to run a convention, unjust terminations of key staff positions, offending Guests of Honor and industry guests and refusing to honor their contracts, and heavy-handed censorship of staffers’ Internet postings. The other side naturally counters that their accusations are unjust, and all changes in staff, power structure, etc. were done to make AX and SPJA a more financially sound organization, and to increase attendance from both exhibitors/guests and attendees (whose growth has flatlined for the past few years). Which side is right? Well, one way or another, we’ll find out in a little less than two months. Anyway, this year’s guest list does look pretty good, including such heavy-hitters as Shinichi “Nabeshin” Watanabe, Kenji Kamiyama, Toshihiro Kawamoto, and musical guests Sophia, MELL, and AKB48 (huh… Morning Musume last year, AKB48 this year… the circle is now complete??!). There are also rumors that legendary expatriate otaku Danny Choo himself will be there, no doubt promoting his latest anime-related project Chinka. Of course, there will also be your usual convention fare, including a truly awe-inspiring dealer’s room, artist’s alley, AMV contest, masquerade, console and tabletop gaming, and various and sundry panels and workshops. AX hasn’t gone totally industry, however, as there are still quite a few fan-run panels and workshops in the lineup – and yours truly, as it turns out, will be running two of said workshops (yes, I’m finally getting to the point of this long-winded post!). “Anime Podcasting for Beginners” is basically the same song and dance I’ll be giving at Fanimecon (with changes based on my experiences there). If you’ve ever wanted to start your own anime or manga related podcast but just weren’t sure how, then this is the workshop for you! According to the preliminary scheduling info I’ve been given, this fine event will take place on Sunday, July 4, from 9:00 AM-10:00 AM (sorry folks, I have no say in the matter), in LP3. My second panel, “Convention Photography 101: How To Get The Shot (and make it look easy! )﻿” will help you if you’ve ever had that experience where you take a bunch of pictures at con, excitedly hurry home and load them on your computer, but are greeted with only pain and misery (and a bunch of blurry or sub-optimal shots). We’ll show you how you can get that great shot, whether you’re armed with a crappy point and shoot or a DSLR with more knobs and buttons on it than the space shuttle. If you think that sounds familiar, yes we did talk about it on the podcast. (Unfortunately my friend Dave who was my co-host on that episode won’t be able to make it to AX.) That workshop will also take place on Sunday the 4th, at 12:30, in WS1. (Note: this is a new room and time!) So if you’ll be in the LA area come July 4 weekend, come on down! Pre-reg for AX as well as hotel registration is online at the AX website. 4 comments to It’s officially official, part deux: Looks like I’ll be at Anime Expo as well!